The Uzbekistan and Kyrgyzstan tour provides a unique insight into the rich cultural heritage, breathtaking nature and fascinating history of the exotic region of Central Asia. A professional tour guide will show you around five stunning cities of the region, and you will learn more about the history of the two Asian countries, you will also get to see the rural beauty that is the nature shared by the nations with breathtaking views of beautiful lakes and mountains. Welcome to Tashkent - the magnificent capital of Uzbekistan! Your driver meets you at the airport and transfers you to your centrally located hotel for check-in. After having some rest you meet your guide in the hotel lobby and go on a wonderful sightseeing tour around the most interesting Tashkent attractions. During the tour, you explore the 16th century Barak Khana Seminary, the Chorsu Bazaar, the Kukeldash Madrassah and go inside the largest acting mosque in Tashkent - the Tila Shaikh. You also see the Independence Square, Alisher Navoi Theater, Amir Temur Square and the new part of the city. Following breakfast, you check out from your hotel and your driver transfers you to the Tashkent airport for a quick flight to Bukhara (flight tickets are included). Upon arrival, you are transferred to your centrally located hotel for check-in. You then meet your guide in the hotel lobby and enjoy a full-day sightseeing tour around the most prominent Bukhara attractions. During the tour, you walk through the central city square Lyab-i Khauz and see its magnificent architectural ensemble surrounding the small pond. You also visit Madrassah Nadirkhon, Devanbegi, Khanaga, Mogaki Attari mosque, Poi Kalon minaret and mosque, Madrasahs Aziz Khan and Ulugbek. Then you explore the Ark Fortress, Balakhauz mosque, a mausoleum of Ismail Samanid and Chashma Ayub. Following sightseeing you enjoy the Folklore show in Bukhara city. After the tour, you return to your hotel and have the rest of the evening at leisure. After breakfast, you check out from your hotel and your driver transfers you to one of the greatest cities of the legendary Silk Road - Samarkand. Along the way you visit the center of the world-famous handmade ceramics Gijduvan, where you witness the process of making the unique ceramic items and enjoy the atmosphere of local life. You then make a stop to see the house-museum-workshop of Abdulla Narzullaev who is a Master of Ceramics of Gijguvan and visit the Summer Palace of the last Emir of Bukhara. En-route you also make photo stops at breathtaking cotton fields, the cotton factory and at the ancient Karavan Sarai called Rabat Malik, built along the Great Silk Road. 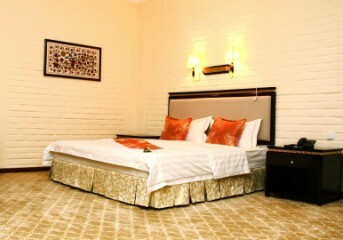 Upon arrival to Samarkand, you are transferred to your centrally located hotel for check-in. Later you meet your guide in the hotel lobby and enjoy a walking sightseeing tour around the most interesting Samarkand attractions. During the tour you see the Gur Emir mausoleum of the famous Asian conqueror Great Tamerlane, visit a picturesque Registan Square and explore its amazing ensemble consisting of three beautiful madrasahs: the 15th-century Ulug-Bek Madrasah and the 17th-century Tillya-Kori Madrasah and Sher-Dor Madrasah. Following breakfast, you meet your guide in the hotel lobby and continue exploring the most interesting treasures of Samarkand. You start with a visit to the famous historical Friday mosque Bibi-Khanum named after the wife of 14th-century ruler Amir Timur. Then you proceed to the Silk Road bazaar, see the Shahi Zinda necropolis and visit the Ulugh Beg Observatory that is considered to be one of the finest observatories in the Islamic world. Right after the tour, you are transferred to the railway station where you board a high-speed Afrosiyob train that takes you to Tashkent in just 2 and a half hours (train tickets are included). Upon arrival, you are transferred to your centrally located hotel for overnight. After breakfast, you check out from your hotel and your driver transfers you to the Tashkent Airport for a quick flight to Bishkek- the capital of Kyrgyzstan (flight tickets are included). Upon arrival, you enjoy a short Bishkek sightseeing tour that includes visits to Ala-Too Square, Old Square and Manas Square called after Kyrgyz legendary hero Manas. In the afternoon you are transferred to Cholpon Ata nestled on the northern bank of Lake Issyk-Kul. Along the way, you explore the petroglyph field and the Burana tower situated in the center of an ancient town Balasagun. Upon arrival to Cholpon Ata, you are transferred to your centrally located hotel for check-in and have the rest of the day free. Following breakfast, you check out from your hotel and your driver transfers you to Karakol - the fourth largest city in Kyrgyzstan. Along the way you drive past the breathtaking Semonovskaya and Grigoryevskaya gorges where you stop for a picnic. You then make a stop to visit the Prezhevalsky Museum built to commemorate a renowned explorer of Central Asia, Nikolai Przhevalsky. Upon arrival to Karakol, you check in to your hotel. In the evening you meet your guide and enjoy a wonderful city tour, that includes visits to the Russian Orthodox Cathedral decorated with icons, pictures and wall paintings and the Dungan Mosque built in Chinese style without a single nail. Following breakfast, you check out from your hotel and your driver takes you to Bokonbaeva Village where you visit a golden eagle hunter’s home. After lunch, in a local cafe, you are transferred to your centrally located hotel in Bishkek and have the rest of the day at leisure. This is the last day of your amazing Uzbekistan - Kyrgyzstan tour! After breakfast, you check out from your hotel and your driver transfers you to the airport for your flight back home. We wish you a safe flight and hope to work on your future trips! Interested in extending your trip for few more days? Trips to the Georgia and Azerbaijan or to Tibet are ideal options for you! Contact your travel specialist for details.